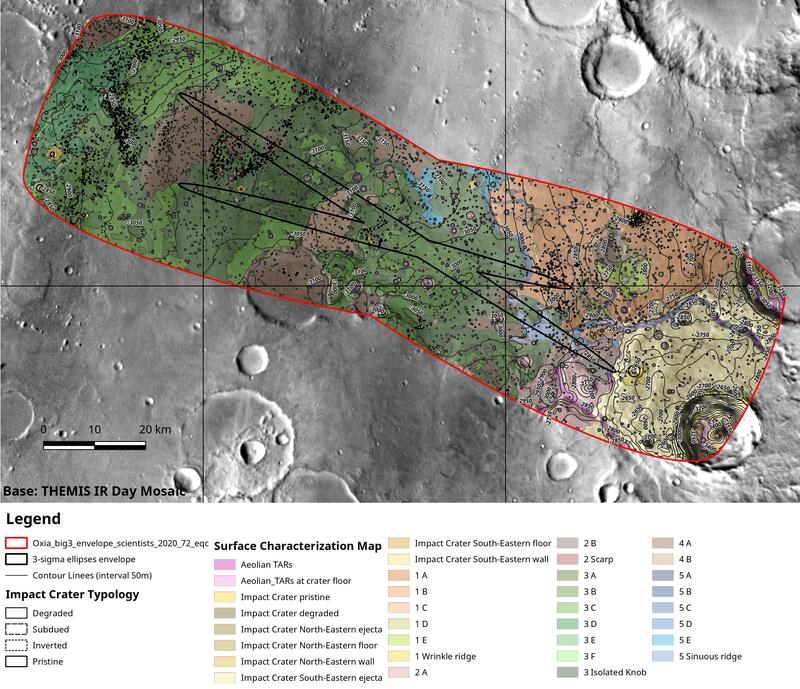 One example of how the Oxia Planum landing site candidate for the ExoMars 2020 mission is being analysed. The map outlines a boundary that encapsulates the range of possible landing ellipses, with some added margin. The colours represent the variety of surface terrains identified, including plains, channels, impact craters and wind-blown features, for example. It is not a geological map intended for scientific analysis, but rather a tool used to identify different surface textures and where potential hazards may lie. The narrow ellipses with the black outline mark the most likely landing zones for the extreme case of the very beginning and end of the launch window respectively (the launch dictates the arrival inclination and there are other scenarios in between). The central touchdown point in Oxia Planum is the same regardless of the actual launch date in the 25 July–13 August 2020 launch window. The background image is from the Thermal Emission Imaging System instrument on NASA's Mars Odyssey orbiter.